Louisiana’s winters are so crazy. One day, it’s in the 20s and two days later, it’s in the 70s. I can’t figure out a menu with all of these darn weather changes! One day, it’s perfect for comfort food and the next, I feel like I need to make kabobs on the grill haha! Place the oven rack in the middle position and preheat the oven to 450 degrees F.
In a large bowl, combine the cornbread, 1 1/2 cups cheese, 1/4 tsp. salt and 1/2 tsp. pepper. Heat the oil in a 12-inch oven-safe skillet over medium heat, until simmering. Add chopped onion and chipotle pepper, and stir/cook the mixture until the onion has softened (about 5 minutes). Add in the ground beef, being sure to break up the ground meat well as it cooks. Cook the mixture for about 5 minutes, until the beef is no longer pink. Stir in the beans, Ro-Tel and reserved juice, and cook until thickened, about 5 minutes. Add in 2 tbsp. cilantro and the other 1 1/2 cups of cheese, and stir the mixture well. Season with salt and pepper, to taste. 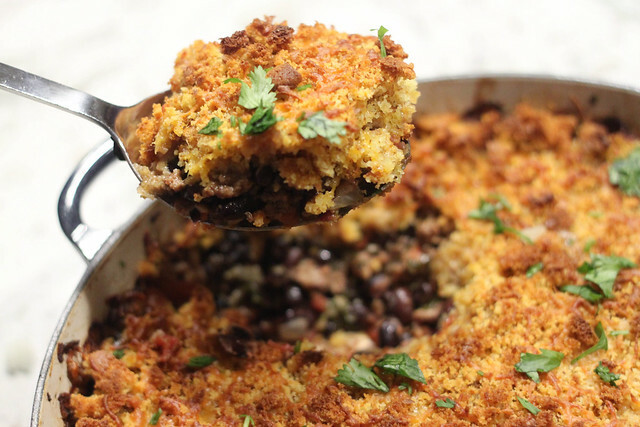 Sprinkle the cornbread mixture evenly over the meat/bean filling. 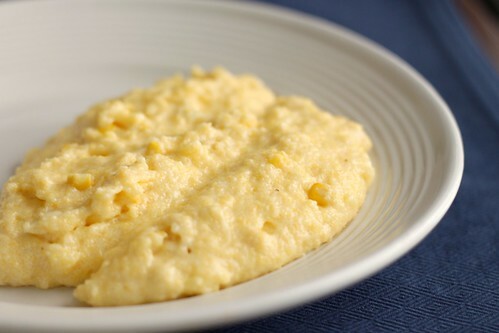 Place the skillet in the oven, and bake until the cornbread mixture is golden brown (about 10-15 minutes). Garnish with the remaining cilantro. Enjoy! Disclaimer: I received a copy of Dinner for Two, in exchange for a fair and honest review. All opinions are 100% my own. House stuff is really starting to get hectic for us. With Christmas just around the corner, and this big move about to happen, I honestly just want to go home after work and be lazy. I don’t want to pack boxes or worry about cooking dinner. I just want to chill…I really miss my afternoon naps, y’all. 😛 Adult problems. I met Julie at Food Blog Forum in 2013, and ever since then, I’ve been a fan of her blog. 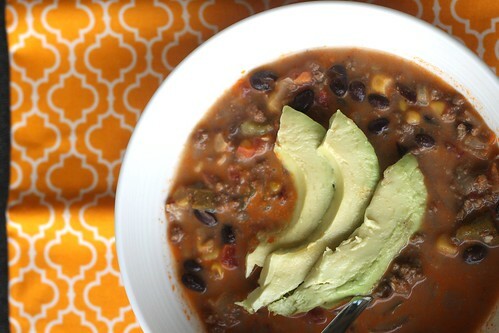 She has gorgeous food photography, and she features a little bit of everything in her blog. 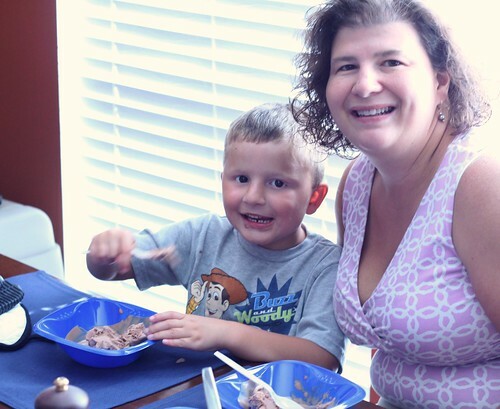 One of the first recipes I tried from her blog was her Slow-Cooker Chicken Tikka Masala (which was delicious….I never blogged about it, but if y’all love chicken tikka masala, you have to try that recipe!). Once I received her book in the mail, I immediately put post-it flags all over this book…there’s so many great dinner ideas! 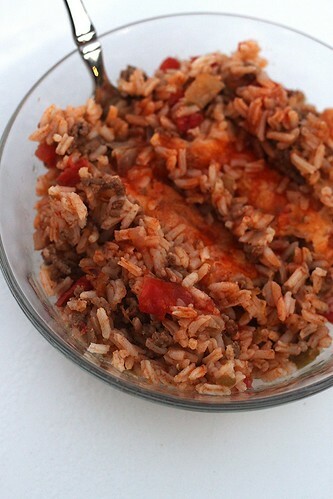 The first recipe we tried was this Beef Enchilada Rice Bake, and y’all…this recipe was so easy to throw together. Since it calls for cooked rice, I had the rice cooking while I was prepping and cooking through the first couple of steps. The timing worked out perfectly for me, since our rice cooker has rice ready in about 15 minutes. After flipping through Dinner for Two a few times, this book would make a wonderful gift this holiday season (it’s under $20 on Amazon right now). It’s perfect for anyone looking for quick and easy dinner ideas. I love that this book revolves around portions for two people…it’s just my husband and I, and we don’t need a ridiculous amount of leftovers we end up with after making some of my go-tos. If you want more of a sneak peek of the book and to check out the recipes other bloggers are making out of Dinner for Two, check out Julie’s Virtual Date Night-In! In a large skillet, over medium-high heat, add the vegetable oil. 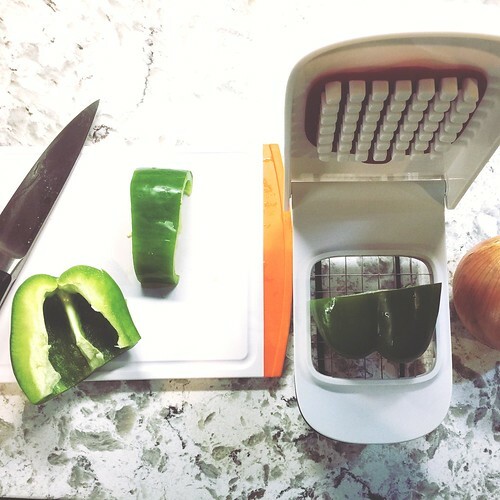 Once the oil is heated, add the onion, green bell pepper and garlic. Saute the mixture for 5 minutes, stirring often. Stir in the cumin, salt and black pepper. 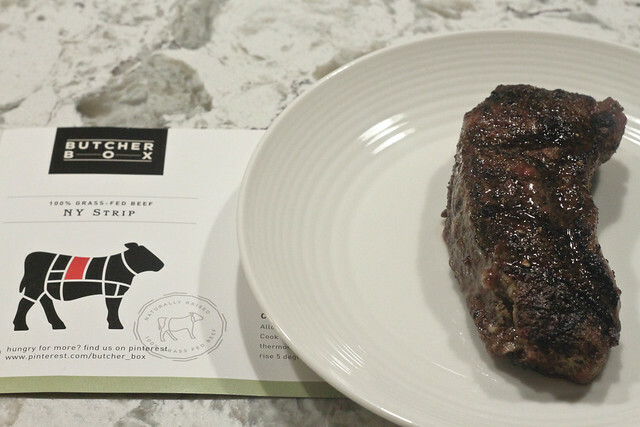 Place the beef into the skillet and thoroughly cook the beef, breaking it up into pieces with a wooden spoon or spatula. Stir in the tomatoes/green chiles, and remove the skillet from heat. Add in the rice to the skillet, and stir everything together until everything is evenly distributed. Stir in the enchilada sauce, until just incorporated. 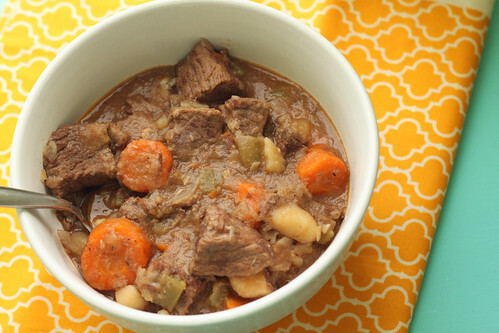 Place the mixture into a 2.5 quart oven-safe casserole dish. Sprinkle the cheese evenly over the rice. Bake the casserole in the oven on the middle rack, uncovered, for 20 minutes. Carefully remove the casserole from the oven and drizzle on more enchilada sauce, if desired. Enjoy! 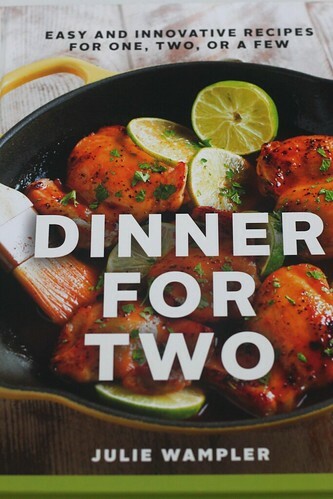 The generous publishers of Julie’s book want to offer one lucky reader of The Nifty Foodie a copy of Dinner for Two! Note: This giveaway is supplied by the publisher and is open to readers in the continental US only. Entries will be accepted until December 16th, 2015 at 11:59pm (central standard time). Winner will be emailed (make sure you leave an email address in the form), and will have 48 hours to respond or another winner will be chosen. As you may know, I’m a big fan of tex-mex cuisine. I haven’t really enjoyed much of it, though, because I can’t really trust myself in a restaurant where I can just get a margarita within 2 minutes or mindlessly eat chips and queso (I swear, my stomach is a bottomless pit when it comes to chips and queso). It’s kind of sad how much I miss it, because really, it’s just food right? At least I try to tell myself that when I’m reaching for a Ben & Jerry’s pint at the grocery store. I first heard about these “cupcakes” when I met Emily of Emily Bites at IFBC last year in New Orleans. Emily’s blog features healthier recipes, which I can really appreciate, so when I heard about them, I swore I’d make them ASAP. Well, I sort of forgot about this recipe, like I always seem to do, until my coworker mentioned them recently. (Random thought of the day: For some reason, I find it SO weird when I find out people I know are reading food blogs. I know blogs are usually very popular, but where I live, a lot of people are really unfamiliar with the concept of a blog.) Anyway, when she brought up how much she LOVED these things, I had to make them ASAP. Unfortunately, wonton wrappers were out of stock for about 2 weeks, which really stunk. I contemplated cutting egg roll wrappers, but eventually, I found a pack in the store. SCORE! The night I made these, my husband kept asking what I was cooking. When I said taco cupcakes, I’m sure the poor guy was pretty darn confused. 🙂 When they came out of the oven, I quickly threw a few on a plate and scarfed them down. These are delicious! The crunchy wonton wrappers make it seem like you’re enjoying a crunchy taco, minus getting neck aches from leaning over to eat a taco. 😛 My husband was pretty darn surprised about the taste too, so these will definitely be a part of our regular recipe rotation in our house. Besides being tasty, while these cupcakes don’t seem that large, they are pretty darn filling too! 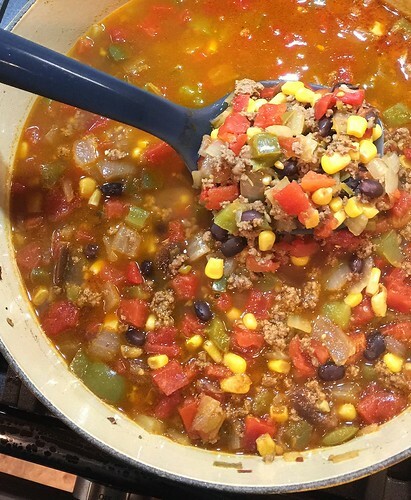 Just a small note, though…the main thing that I changed was that I used corn instead of black beans (since I am not a fan of beans, personally). I’m sure they’re wonderful with beans too, and I imagine with beans, they’re even more filling! Preheat your oven to 375 degrees. Prep your muffin tin by misting 8 of the cups in a muffin tin. Heat the canola oil in a large skillet over medium heat. Then, add the ground beef as well as the taco seasoning, and cook the meat, breaking it up with a spoon or spatula, until the meat is browned. Add the corn to the meat and cook the mixture (stirring often) for a few more minutes, until the mixture is warm. Gently push a wonton wrapper into the bottom of 8 of the muffin tin cups, and spoon a tsp. of the queso into the bottom of the wonton wrapper, using the spoon to spread the queso evenly along the bottom. Add some of the meat mixture into each cup (evenly using 1/2 of the mixture for all 8 of the muffin cups), and then add some of the salsa into each cup (evenly using 1/2 of the salsa for all 8 of the muffin cups). Sprinkle some of the shredded cheese (evenly using 1/2 of the cheese for all 8 of the cups). 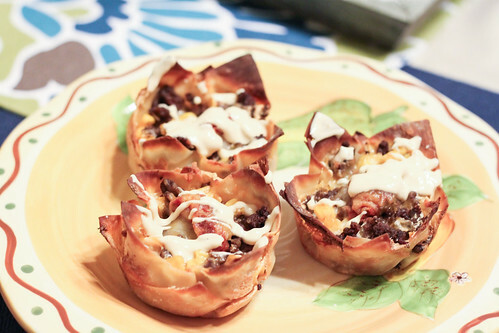 Then, gently push another wonton wrapper on top of the cheese, and layer the “cupcakes” the same way you just did (queso, meat mixture, salsa, shredded cheese) using the rest of the layering ingredients. Bake the “cupcakes” for 18-20 minutes until the wontons are golden brown. The tips of the wonton wrappers will get seriously dark while in the oven if you want the rest of the wonton wrappers to get pretty crispy. Allow the “cupcakes” to cool for 5 minutes before taking them out of the muffin tin. Feel free to drizzle them with more warm queso after baking. Enjoy! Burgers are such an easy meal to throw together in the summer. We used to make our burgers with 93% lean meat, but we’d hate how dry the burger came out. I thought it was the recipe, but no, it was the meat. You totally need some fat in that beef to make a burger taste absolutely amazing. We usually buy 93% meat for most of our cooking, but now for burgers, we get 80% or 85%. Whatever is on sale. I swear it makes all the difference in the world. Now, I’m sure most of you are thinking, “Ok Amy, seriously? You didn’t know this?” Yeah, I really didn’t know that this made the difference. My husband knew, but stubborn me kept blaming it on the recipe. For the 24×24 party we threw, we googled the heck out of Minneapolis food and found that the Juicy Lucy was pretty darn popular out there. Such a simple concept…a cheese stuffed burger. The cheese fiend in me wants to know why aren’t those served out here?? We need Juicy Lucy burgers in our lives…seriously. 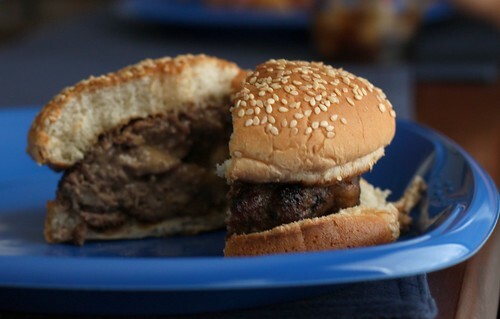 And if you haven’t had a Juicy Lucy burger yet, I highly recommend you try making these. Absolutely delish! Using a potato masher or your hands, mash the bread, milk, garlic powder, onion powder, salt and pepper in large bowl until smooth. Add beef and gently knead until well combined. Grill burgers over medium fire until well browned and cooked through, 6 to 8 minutes per side. Transfer to plate, tent with foil, and let rest 5 minutes. (Since the cheese is very hot, don’t omit the resting part.). Makes 4 burgers. When I was a little kid, I had such trouble spelling “Mississippi”. Was it too many “s”s or the double “p” that threw me for a loop? I just couldn’t get it. My house was less than a tenth of a mile away from the river, and I just couldn’t spell it. That bothered me. My parents taught us a little fun way to spell it eventually, and now I can’t ever spell Mississippi wrong. When in doubt, I tell myself “M-i-s-s… I-s-s…i.P.P.i”. There was an emphasis on the cap letters, so it became a bit of a rhythm to say it in my head that way before spelling it out. Since I grew up living so close to the Mississippi, I’ve seen the river have its ups and downs. Literally. When the river gets high in the Spring, boats appear like they are floating on the levee. And of course, when it gets low, you’ll barely see the tops of the boats. It’s crazy how much it varies, and this year was no exception. For the first time in almost 40 years, the river was so high that the Corps of Engineers had to open a spillway north of Baton Rouge in order to save New Orleans and Baton Rouge from catastrophic flooding. Sadly, this spillway isn’t just land. People actually built their homes and farms in the spillway, so they had to evacuate. While I’m glad that nothing catastrophic happened to our big cities, it still hurts to know that some people suffered from this. While I was watching a news segment about the river one night, I couldn’t help but think about the massive journey that the water takes. All the way north from Minnesota to the Gulf of Mexico. There are so many different cities that the river just flows by, and my husband had the greatest idea. A culinary journey down the river–from Minneapolis all the way to New Orleans. Our party idea featured foods that are notorious in the major cities along the river: Minneapolis, St. Louis, Memphis and New Orleans. I was so stoked when Foodbuzz let me know that our party proposal had been accepted for this month’s 24×24, so I called up our families and had them over for this awesome party! For Minneapolis, we grilled up the famous Juicy Lucy burger! You can’t go wrong with a cheese stuffed burger, and this burger was one of the favorites of the meal! For St. Louis, we baked a gooey butter cake. We served it with ice cream and various summer fruit sorbets. The cake is a yeast based batter on the bottom and of course, a gooey butter base layer on top. 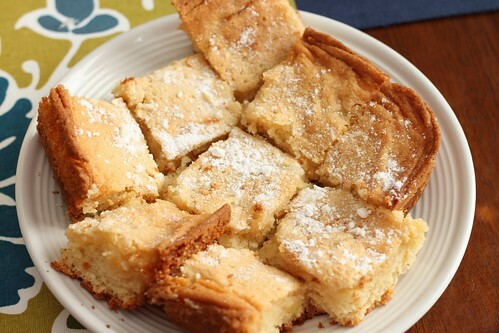 Many of us (myself included) have never had a gooey butter cake, but it was a great hit! I think next time, this would go perfectly with some fresh fruit. For Memphis, we made some fabulous BBQ Baby Back ribs. This was my first time ever working with ribs, and it really wasn’t that bad. These were very flavorful ribs and super tender, since they were in an oven for a good part of the morning before finishing off on the grill! Oh, and since we’re all from Louisiana, we had to add in a little lagniappe for NOLA: Hurricanes. I mean, how could you NOT? 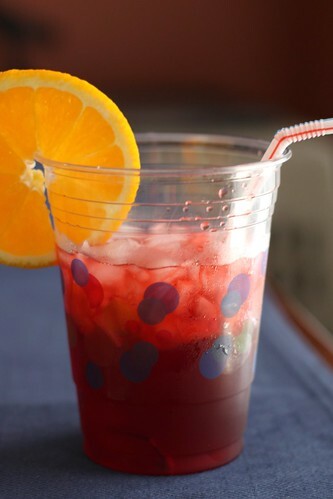 For a hot, summer day, these are always a hit! Thanks so much to Foodbuzz for making this party happen! We really enjoyed the different foods from cities along the river, and also had a blast spending time together! I can’t ever settle on one recipe! I love meatloaf. 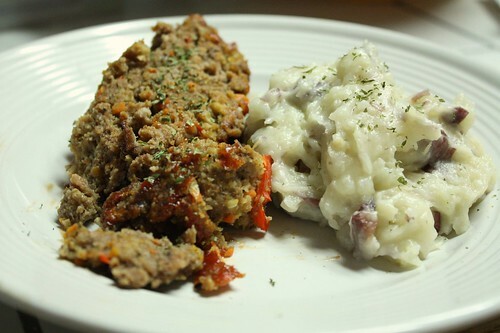 My Mom used to make meatloaf for us all the time as kids, and almost everytime I have meatloaf, it reminds me of my Mom. 🙂 We joke about the way my Mom makes hers, though. She forms it in a donut shape and nukes it in the microwave. Yep, she nukes it. AND it comes out perfect! Crazy, right? 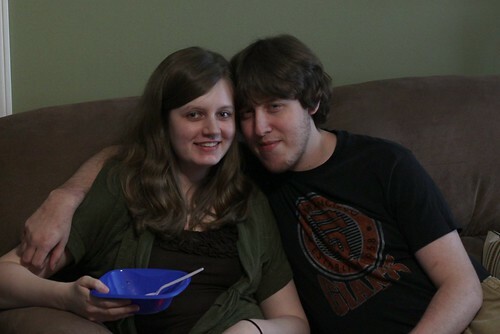 The hubs and I, about a year ago, found our go-to recipe for meatloaf. We still love it..it’s fabulous, I promise. However, I’m always wondering if something better is out there, and I stumbled across this recipe from Alton Brown. The hubs was a bit skeptical when I mentioned I was trying a new recipe. He wanted his favorite, and I don’t blame him. However, this meatloaf came out yummy! You don’t taste the vegetables, but you get an explosion of flavor and it has a good kick to it too. 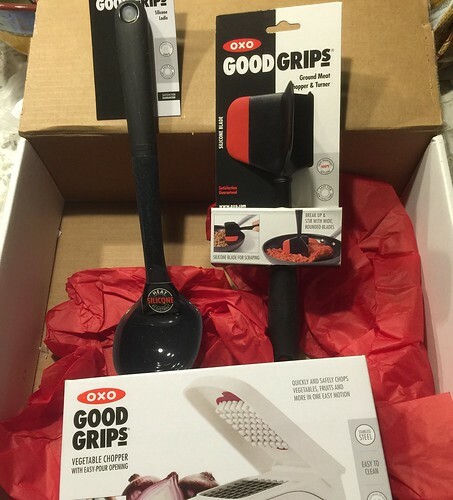 I think our go-to is slightly better, but this one is less steps and dishes. Torn…. I will say that this meatloaf recipe just really changes the way I think of meatloaf, because of the kick from the chili powder and cayenne. I’m thinking of somehow merging the two types of flavor profiles to get a (hopefully) awesome recipe someday, if I’m brave enough. In a food processor bowl, combine croutons, black pepper, cayenne pepper, chili powder, and thyme. Pulse until the mixture is of a fine texture. Place this mixture into a large bowl. Combine the onion, carrot, garlic, and red pepper in the food processor bowl. Pulse until the mixture is finely chopped, but not pureed. Combine the vegetable mixture and ground beef with the bread crumb mixture. Season the meat mixture with the kosher salt. Add the egg and combine thoroughly, but avoid squeezing the meat. 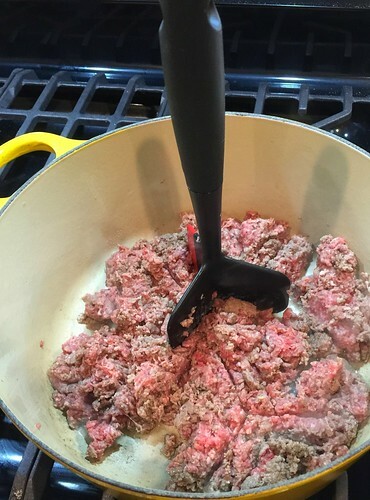 My husband and I usually keep two types of meat on hand for cooking: chicken or ground beef. 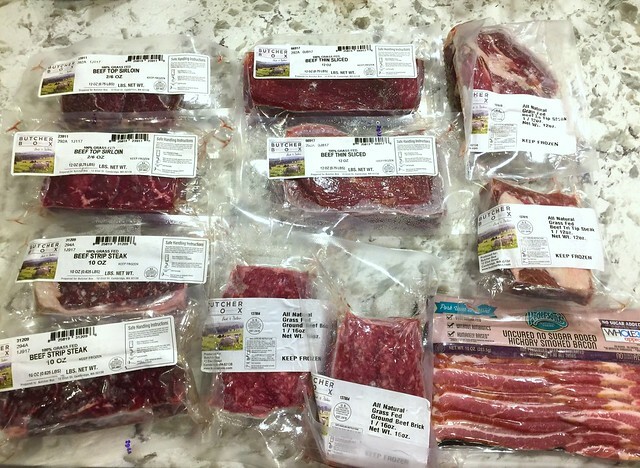 Sometimes we stray from the norm and do seafood or steaks, but to make our food budget happy, those are our staples. 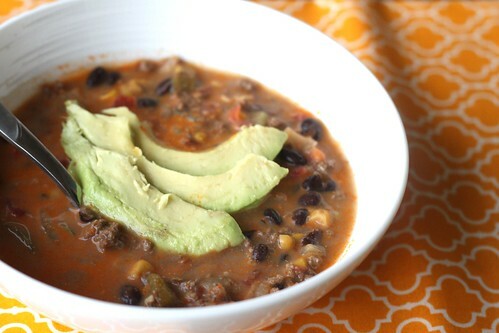 Chicken is so versatile and super easy to find meals for, but ground beef? I always feel a little limited there for some reason. I find it hard to find new ways to incorporate ground beef into our meals (feel free to comment if you have good ground beef recipes). Heat oil in large skillet over medium-high heat until shimmering. Add onion and salt and stir until coated with oil. Reduce heat to medium, cover, and cook, stirring occasionally, until onion is soft, about 10 minutes (if onion begins to burn after 5 minutes, reduce heat to low). Add garlic and chili powder and cook, uncovered, stirring constantly, until fragrant, about 30 seconds. Add beef and cook, breaking up meat with wooden spoon, until just pink, about 3 minutes. Add 1/4 teaspoon pepper, brown sugar, tomato puree, ketchup, water, and tabasco. 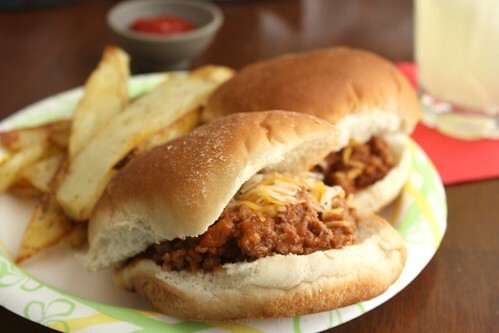 Simmer until Sloppy Joe sauce is slightly thicker than ketchup, 8 to 10 minutes. Adjust seasonings. Spoon meat mixture onto hamburger buns and serve.